The probably largest mushroom in Luxembourg's Little Switzerland, is indeed not edible, but it is even more impressive: The "Champignon" is a standalone block of Luxembourg sandstone. The rock owes its shape to the various properties of individual sandstone layers that make it up: a solid, less eroded sandstone layer forms the hat, the foot consists of layers that are easier to remove. It is a weathering remnant of the sandstone layer that was deposited in the time of the Lias about 200 million years ago and originally extended further north. Today you have a fantastic view of the upstream, hilly Mergellandschaft in this direction whose rocks were formed in the Keuper period 210 to 230 million years ago. 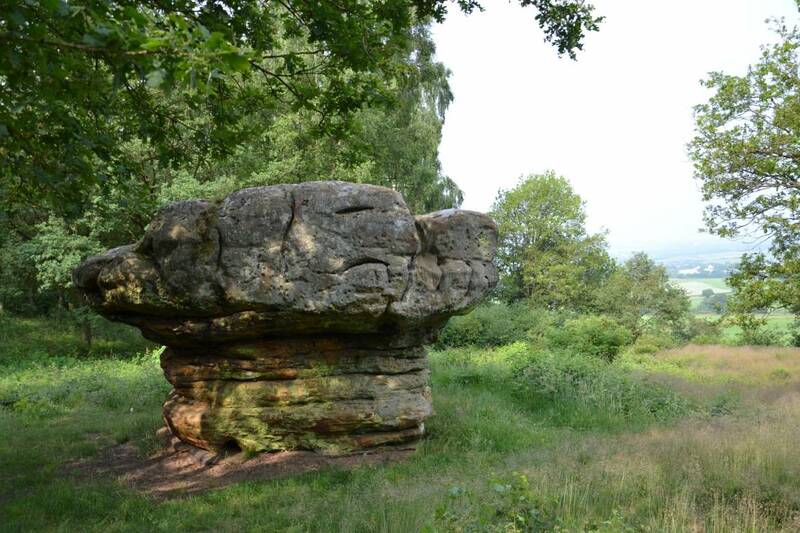 In the surroundings of the "Champignon" there are sandstone blocks with traces of human use. These include well visible grinding grooves created by people grinding their stone tools on the sandstone. It is disputed whether some of the signs and hollows served mythical purposes. The flora around the rock is also a very special: The thin nutrient-poor and dry sand cover of the soil is the rare habitat of a sandy dry grass, which is interspersed with heather. The champignon can be hiked from Nommern on the 5.2 km long local hiking trail N4.